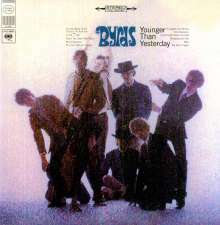 Der Artikel The Byrds: Younger Than Yesterday (180g) wurde in den Warenkorb gelegt. »Younger Than Yesterday« is The Byrds' fourth album and was originally released in 1967. As on its predecessor, the album features elements of psychedelic rock, including brass instruments and reverse tape effects. On the other hand the first country and western influences can be found on the album, being early indicators of the country rock direction the band would pursue on their later albums. Nowadays »Younger Than Yesterday« is considered one of The Byrds' finest albums. This is illustrated by the fact that Rolling Stone magazine ranked the album at #124 on their 2003 list of The 500 Greatest Albums of All Time.